Baba ghanouj, also called mutabbal beitinjan (or, properly, bathinjan), is so easy to find in Arab restaurants in the Middle East and abroad, it’s practically become a cliché. But there is a reason it’s so ubiquitous: it’s delicious! It’s hard to resist the combination of sharp garlic, earthy tahini, fragrantly smoky eggplant, and bright lemon juice. First, the name. “Baba ghanouj” (as it should be spelled; no “ganoush” or “ghanoush” which are not real words), roughly means “dad is spoiled,” or “dad is coy,” or, even, “dad is mildly flirtatious.” Who is this dad? No one knows. Perhaps it’s the person being lovingly spoiled when served this tasty dish. Or perhaps it refers to the eggplant itself, often given a place of honor (“the father,” if you will) among vegetables in Arab cuisine. Its other name, mutabbal beitinjan, is so much more straightforward: it simply means dressed or marinated eggplant (beitinjan or bathinjan means eggplant). Though, to a lesser extent and depending on where you are eating this dish, each of these names can refer to a similarly dressed eggplant dish that doesn’t include tahini. But for our purposes, it’s baba ghanouj. Onward…. Second, I’m including measurements, but they mean little in this case. Why? Though this dish always has the same 6 or 7 ingredients, each person usually has preferences on how their baba ghanouj should taste. I like mine well-balanced, but garlicky and with a good dose of tahini. Others prefer a more lemony version or like a lot of the tart pomegranate syrup. And so on. You must taste and adjust to your liking as you go. You may even want to use a little less garlic or tahini (and thus less lemon, which is used to balance the tahini) than I prescribe here, and add more in increments until it’s to your liking. optional: pomegranate syrup (also called pomegranate molasses) *Note: Use a product that is 100% pomegranate, and not doctored with glucose or other substances. 1. Using a fork, poke some holes in your eggplants. Place them on a baking sheet or in a pan lined with aluminum foil (which will make clean-up so much easier). Setting the pan either on the lowest oven rack, or even on the actual “floor” of the oven, and roast them at about 375 degrees F. They should cook through until soft, but also should char a bit and caramelize. Flip them midway through cooking for maximum caramelization. Alternatively, you can grill them (directly, without use of a pan or foil) on your charcoal or gas grill, achieving the same result. When the eggplant has cooked, let it cool to room temperature. 2. Once cooled, use a spoon to scoop out the eggplant from its skin. See those darker parts nearest to the skin? Those have the best flavor; make sure to include every last bit of them. 3. Combine the tahini and lemon juice. Any time you combine an acid (such as lemon juice or vinegar) with tahini, it will first “break,” looking like it’s curdling; you’ve done nothing wrong. Some more stirring will yield a smooth, medium thick paste. You’ll have to taste to see if you like the balance of lemon and tahini, and adjust as necessary. Crush the garlic and add it to the tahini mixture. 4. Combine the tahini with the eggplant and season with salt to taste. You can also add a couple tablespoons of olive oil and/or a couple tablespoons of pomegranate syrup. Again, taste the baba ghanouj and adjust it to your liking. 5. 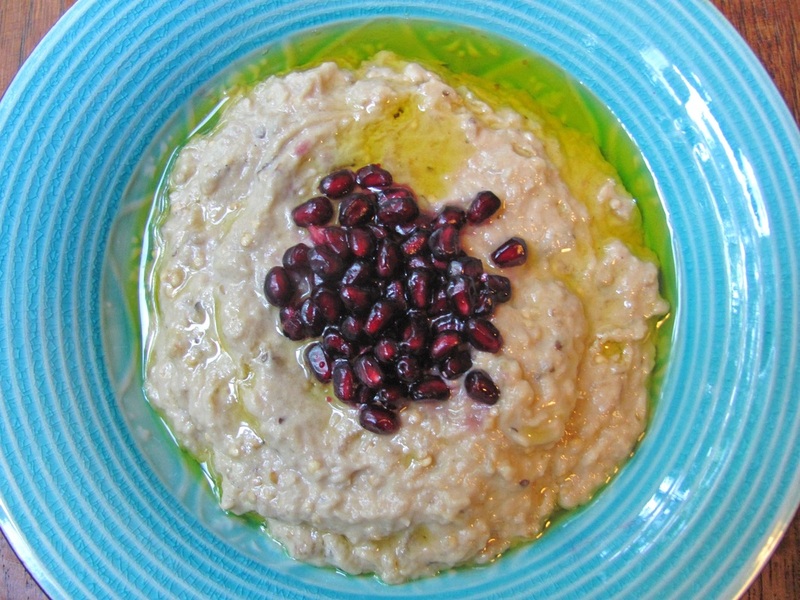 Top with the pomegranate arils, parsley, and a good amount of the olive oil. This entry was posted on 06/07/2012 by glutenfreeuae in Arabic, Recipes and tagged arabic, glutenfree, UAE, vegetarian.